#7Songs – Release Your Inner Nerd !! I am a nerd. There’s no doubt about it and it’s who I’ve been all of my life. In school I never was one of the “cool” kids. I was in Show Choir, Physics Club, Chemistry Club, Student Council, etc. Like many of the folks I know, I was involved in as many activities as I could find because these were my social outlets. The odd thing about being a nerd is that people don’t expect you to do things outside of the box that they put you in. You see, I was also a very good athlete as well as a musician and student. People desperately want people to fit inside their filters and stereotypes because if you don’t it’s unpredictable and that’s unnerving. Another thing that you don’t think of when you’re younger and nerdy is that you’ll “grow into it” later in life. The teenage years are awkward enough without having to carry a moniker of Geek with you. Relationships are challenging because teens (like adults) want to run around with packs of people who are just like them. You aren’t supposed to cross lines. It’s no wonder that when I saw a “nerd” be a rock n’ roll artist, I was drawn to him which brings me to my next song. 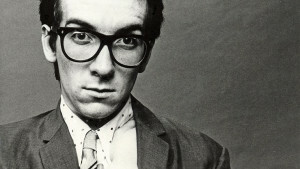 Elvis Costello was unlike anyone I ever had seen in music before and no one made music like he did. When he burst onto the scene, he looked like a Buddy Holly remake, but he was far from anyone who played rockabilly. His tight suits, coiffed hair and HUGE black glasses were outstanding. You could tell by listening to his songs that he was a lyricist. One, in my opinion, that is unmatched in the music industry !! I think I have every song he’s recorded, and this song just hits a note every time I hear it. Like most of his music, Veronica, tells a story. The video is dead on with the song by showing Elvis visit an elderly woman in a nursing home. She fondly remembers the past, but is slowly forgetting the present and even her name. It’s something that perfectly frames a moment in time. Being able to write like that is a gift. No one who “looks” at Elvis Costello expects him to be someone who is enshrined in the Rock n’ Roll Hall of Fame. Ironically, very little of his music ever has had radio play and the general Top 40 public who follow the next great passing trend would hardly recognize him. He’s recorded with legends of the music industry and often has an eclectic mix of artists who back him up. It’s outstanding that he’s never veered from being the original nerd that he always has been. He’s never fallen to the narrow path and formula that record companies force on their artists. I dig Elvis because I believe in living out my inner nerd as well. So, how about you? Are you trying to “fit in” with the folks who want you to blend in with everyone around you so there’s no visible identity or distinction? Break with the crowd and let that inner nerd out !! You’ll be glad you did. Author Steve Browne (Admin)Posted on December 18, 2015 Categories Random ThoughtsTags #7Songs, Diversity, HR, HRMusicShare, Inner NerdLeave a comment on #7Songs – Release Your Inner Nerd ! !